Happy Friday!! I don't know about you, but I am so ready for the weekend!! Life has been crazy!! But first, I'd like to share today's card with you right now. I just adore this little digital vignette, called Graceful Still Life, that Marcella released on the 15th of this month. Isn't it just super charming!! 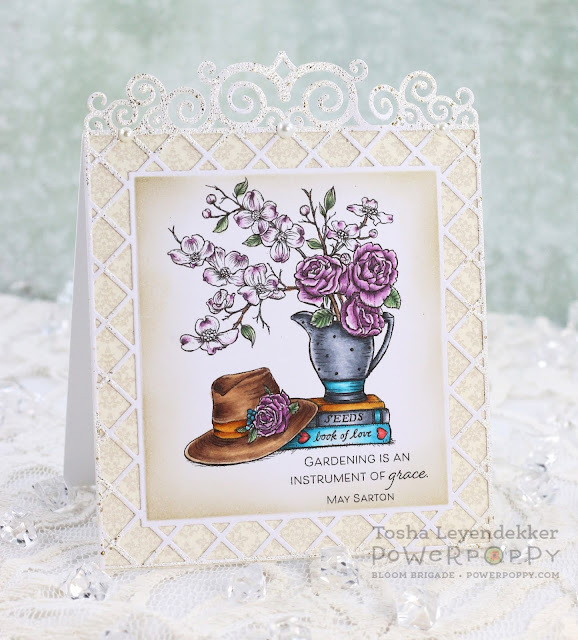 I love how she combined the Roses and Dogwoods with little extras like the sweet hat and charming stack of books. And don't you just love that darling little pitcher as the vase? I did a bit of editing in Photoshop to get the sentiment along the bottom. It's a much larger sentiment, and I only wanted to include the last little line on the front of my card. So I cropped out all the rest and added it underneath the image. Everything is colored with Copics, and the frame was diecut using Spellbinders' Labels 47 Decorative Elements die. I randomly covered it with Versamark ink, and added some Shabby White Embossing Enamel to vintage it up a bit. I also antiqued it up a bit by ink distressing inside the frame, while it was still inside the die, using Ranger's Antique Linen Distress Ink. I'm showing a close-up so you can see the Embossing enamel a bit better. It has some gold and glitter in it, so the shimmer in real life is striking. If you click on the photo, it shows even a bit more. That's it for me today. 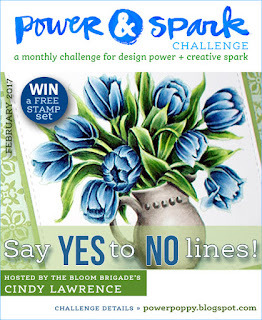 There's still time to participate in the this month's No-Line Coloring Power and Spark Challenge. If you participate, you'll be entered to win a free clear or 3 digital stamp sets. It's definitely worth a try. Hello, Hello, Hello!! 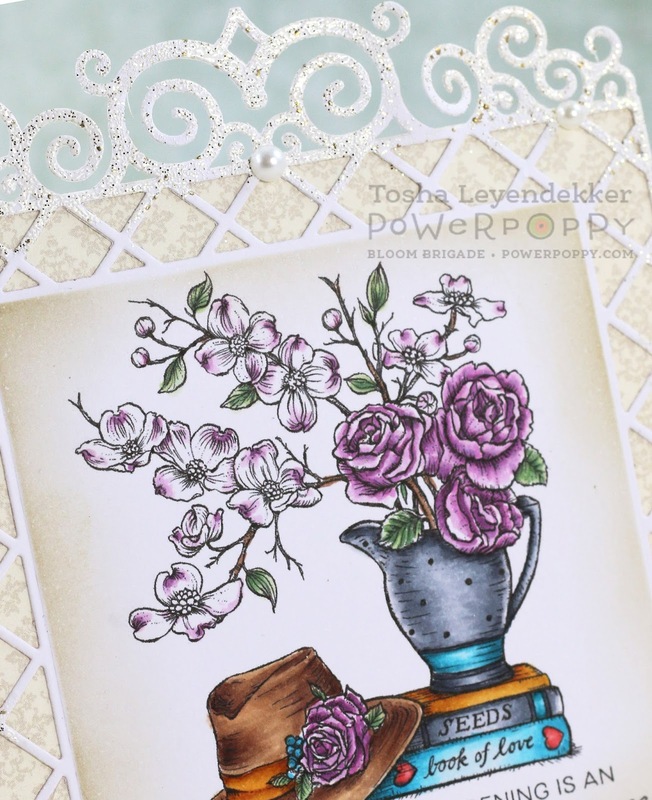 I realize it's not Friday, so this post is probably a bit unexpected, but today is the release date for a new Power Poppy digital image called Pansies. Pansies are near and dear to my heart. My mother's favorite flower was the Pansy, and mine is the Sunflower. I moved over 2000 miles away when I got married over 27 years ago, so our time together was always very precious. First thing in the morning, I would get out "our" mugs and we would share a cup of coffee together. 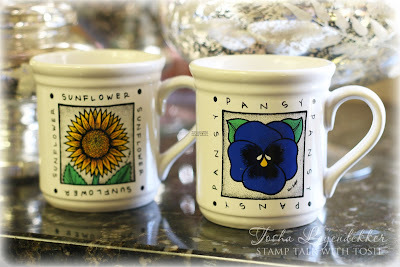 She had her Pansy mug, and I had my Sunflower mug. These mugs must be at least 25+ years old because she's been gone over 22 years now. But I still have them, and they are treasured as well as the memories! 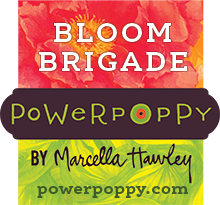 Power Poppy has a new challenge for the month too, hosted by our dear, and oh-so-talented Bloom Brigader, Cindy Lawrence. She is challenging us to use the No line coloring technique. This card was a challenge for me because this was the very first time I tried the "No line coloring" technique by myself. (I took some Copic classes where it was taught, but that is quite different from going out on your own...) It was a challenge, and I have a very long ways to go, but I am happy that I actually tried it. I printed the image in a light gray and colored it with Copics. I also used some pointillism in the background, as well as a burnishing technique for the flowers to give them some extra depth and texture. 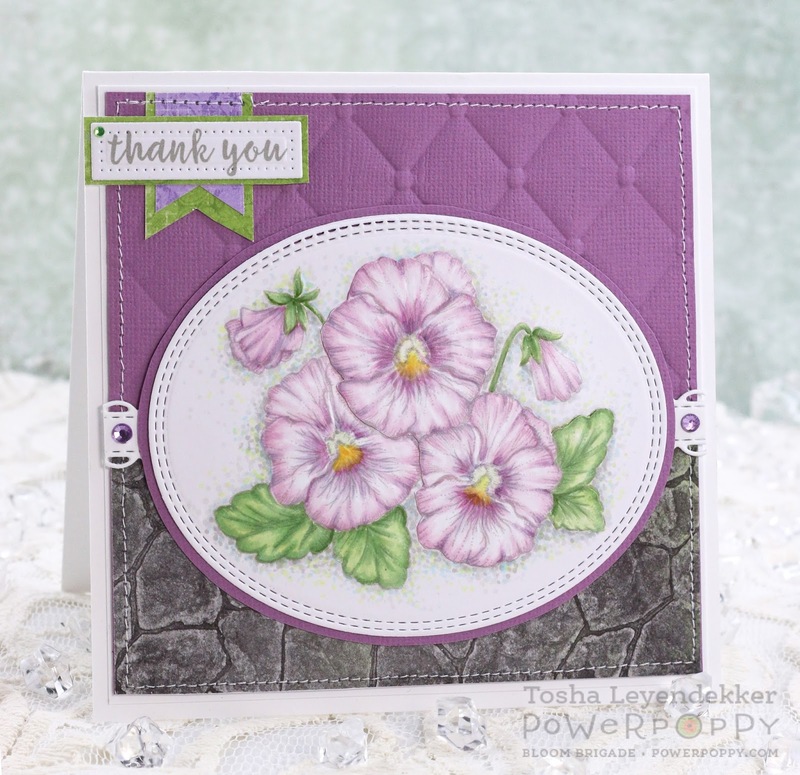 I posted a "Burnishing" tutorial on the Power Poppy blog a couple of years ago, that you can find it HERE. That's it for my project. Now be sure to check out the following Bloom Brigade blogs for some incredible inspiration! Thank you so much for dropping by! I hope your week is off to a fantastic start!